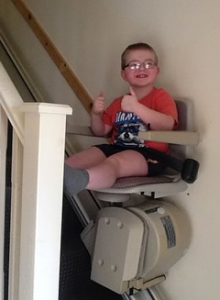 A couple have donated a stairlift to a disabled boy who would otherwise need his parents to carry him up and down the stairs. David Househam, aged seven, has the progressive muscle disorder Duchenne Muscular Dystrophy. He uses a wheelchair and his health will deteriorate as he gets older. David struggles with everyday activities including going up and down stairs and has to be carried by one of his parents. His dad Nigel placed an appeal in the Boston Target for a stairlift and a cutting was placed on the wall of a chip shop. This was seen by Leasingham couple Raymond and Sue Duncan – who had stopped off for a fish and chip supper. They had a stairlift stored in their garage. Mr Duncan said: “We saw the paper cutting on the wall and read it. It really touched us. We had bought a stairlift for my wife’s dad which sadly he never got to use so thought this would be a great cause to give it to. The stairlift will provide a short-term fix until the Househam family, from Woad Farm Road Boston, are moved to a more disabled friendly property. Harbour Light Fish and Chip Shop in Mareham-Le-Fen has been fundraising for David and displayed the Target’s article on David on the wall in the shop. Owner Ian Wright said: “We started fundraising for David Househam when one of my regular customers who works at his school told us that he suffered from Duchenne muscular dystrophy. “I put the article from the Target on the wall so customers could read what we were fundraising for. The Househams are supporting Leonard Cheshire Disability’s Home Truths Campaign to highlight the severe lack of disabled friendly homes in the UK. Campaigns manager Emma Lindsay said: “The generous gift of a stair lift will be a huge help to David and his parents, but this is only a temporary measure for the family who urgently need an accessible home before David’s condition worsens. “People should not have to rely on the kindness of strangers for support, which is why the council and the Government need to address the severe lack of disabled friendly homes in the UK.